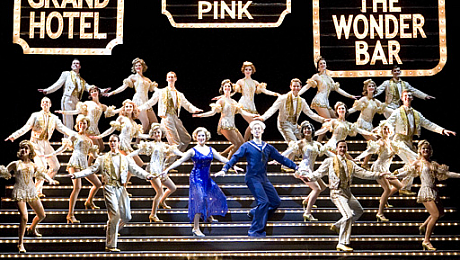 Come and meet those dancing feet...set in Depression era New York, 42nd Street follows the fortunes of Peggy Sawyer as she seeks to find her place on the Broadway stage and the cast of Pretty Lady, the show that she joins. The show doesn’t put a rose-tinted spin on life as a ‘hoofer’ and it should be required viewing for anyone considering a career on the West End purely for lack of sugar coating of the reality that one day you have a job, the next the show is closing and you’re back on the breadline. However in New York in 1933, at least the cast don’t have to worry about finding out on Twitter before the closure notices go up. 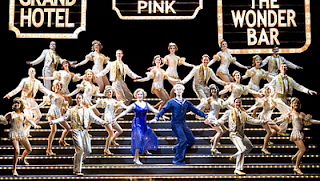 Harking back to the bygone era of musicals, 42nd Street is laden with lengthy dance sequences and the incredible cast don’t put a foot out of step. The cast are the true shining stars of this production. Marti Webb is formidable as leading lady Dorothy Brock and Dave Willetts captures the power and presence of Julian Marsh effortlessly. Jessica Punch is effervescent as Peggy Sawyer and the entire cast radiate relentless energy and enthusiasm. The show opens with a tantalising glimpse of a chorus line of feet as the curtain slowly rises, setting the tone for the whole production. Unlike more modern productions this is a dance-led show and the weaknesses in the book are literally tap-danced over. The solid line of tap-shoe clad feet is almost the last moment they appear to be still as the cast burst into a high-energy tap routine. Immediately from the opening scene the show explodes with energy and feet that seem to become mere blurs of movement, effortlessly undertaking complicated choreography. Without the enthusiasm of the cast and their marvellous dancing the show would be lacklustre. What plot there is provides little for the talented cast to work with in terms of character depth which is a real shame. Certainly Marti Webb is underused and the full power of Dave Willetts’ voice is only revealed towards the very end. Make no mistake 42nd Street is all about those dancin’ feet and with this talented cast it’s well worth heading down to the avenue to hear the beat of dancing feet, their energy will leave you breathless.